This is an unusual, Muhle 4 Piece Shaving Set featuring superb faux horn for the Shaving Brush and Razor Handles. Muhle places great significance on superior engineering and on the ergonomically designed properties of its sets, naturally this set is highly pleasing on the eye. The faux horn looks exactly like the real thing however it will be more durable as horn is prone is cracking and is easily broken if dropped. Badger Hair Brush: This fine shaving brush is made using 'Pure Badger Hair'. It's ideal for lathering shaving soaps and creams alike. A badger hair brush will help lift the bristles off your face and soften the bristles prior to shaving. 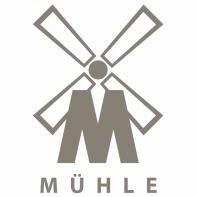 Muhle Safety Razor: This razor uses the same head as the worldwide top selling Muhle R89. As such you can expect a very close, comfortable shave from this razor. The razor has a perfect weight to length ratio, a well balanced razor is essential for a good shave. The Stand and Lathering Bowl: The highly polished, chrome plated metal stand is perfect for allowing the brush to drip dry and aerate naturally - thus prolonging its life. The bowl is suitable for lathering up shaving creams and soaps. It's also handy for catching any drips from the shaving brush after use. Place some shaving cream or soap into the lathering bowl along with a few drops of warm water and use the brush to whisk up a rich creamy lather. Apply the shaving cream or soap to your face. Using the razor, shave twice with the grain of the hair and once against the grain. We recommend you shave at a 30° angle to your face and apply little pressure onto the skin. Muhle has developed a unique process for binding resin to metal, the rings for holding the razor and brush are lined with plastic to ensure a firm grip and to ensure the brush and razor don't get scratched when put on the stand. It's all in the detail with German design and manufacturing! Nothing beats the luxurious feeling of applying lather with a quality badger hair shaving brush. This, along with using a safety razor will give you the closest shave you've ever had! A fabulous gift to yourself or that someone special. High grade resin, metal alloy with shiny chrome plating.